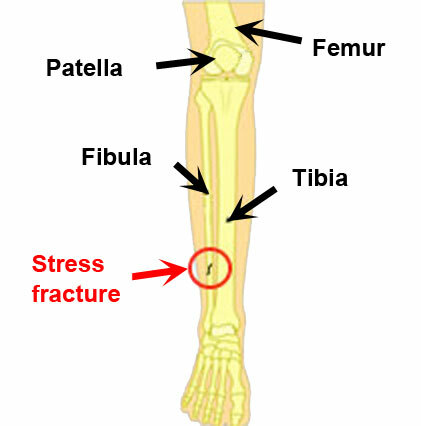 A fibula stress fracture is a small fracture or hairline crack in the bone. It is not as common as a stress fracture of the tibia because the fibula is not used in load bearing in the same way. Symptoms include pain in the calf area with tenderness at a point on the fibula. Treatment includes six weeks rest and a gradual return to full training. Symptoms consist of pain in the calf area with local tenderness at a point on the fibula. Symptoms will usually have developed gradually over time, rather than a specific point in time where the athlete can recognise as when the injury occurred. There will be a pain in the lower leg on weight-bearing although this is not as painful as a stress fracture of the tibia. The pain may ease off after a period of rest but get gradually worse with exercise. The long bones of the lower leg are the tibia and fibula. The main function of the fibula bone is as a point of attachment for many of the muscles of the lower leg. 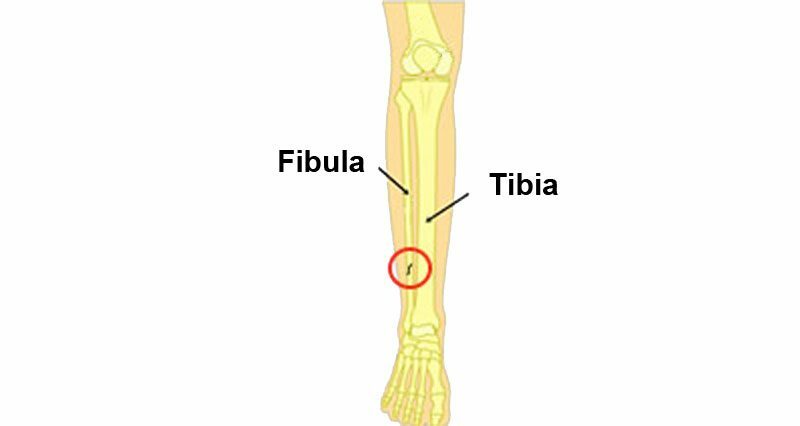 The tibia is the thicker, weight bearing bone of the two whereas the fibula has much of its surface for muscle attachment. This results in traction and twisting forces placed on the fibula bone from the surrounding muscles,which over time cause a stress fracture. Athletes with excessive pronation or rolling in of the feet when running are more susceptible because the peroneal muscles must work harder for longer during toe off in the running gait cycle. As the arch of the foot flattens the ankle rolls inwards, twisting the lower leg and knee. The bones in the foot are not able to take the loads as efficiently as they might which places more strain on the muscles of the lower leg, many of which attach to the fibula bone. Overpronation and other biomechanical dysfunctions of the foot can be corrected with orthotic inserts which are placed in the patients shoes. They control the position of the heel and so enable normal foot biomechanics. Rest from training and competition until the local bone tenderness is gone. Substitute running for swimming or focus on the upper body. Anything that works the calf muscles is not likely to allow sufficient rest to enable healing to take place. A stress fracture is unlikely to show up on an X-ray until two or three weeks into the healing process, although a bone scan or MRI may give more information. Rest from running and other aggravating activities for a period of 6 weeks is often recommended. After the period of rest is completed a further X-ray should be taken, at which point a stress fracture may show up along the line of the fracture, seen as new bone tissue. 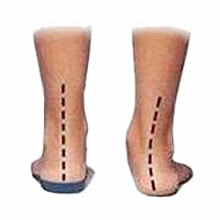 Wearing a heat retainer calf support will protect the muscles of the lower leg reducing the load on the fibula bone. Before returning to full activity stretching and strengthening exercises should be done on a regular base to ensure the muscles are in good condition, strong enough and flexible enough to cope with the demands of sports training. Any biomechanical dysfunction such as overpronation should be corrected to avoid the injury recurring. Look at training methods to determine if overtraining, increasing workload too soon, or poor shoe selection is a factor. Running shoes should be good for around 400 miles or six months. After that the quality of the midsole will begin to deteriorate so the level of cusioning and support may be reduced. What can the sports injury therapist do? A professional thereapist may apply sports massage techniques to the muscles of the lower leg. This will help restore the condition of the muscles making them flexible and supple. A very gradual return to full training is required. They can advise on stretching and strengthening exercises for the lower leg muscles. Stretching exercises are more important than strengthening for recovering from a fibula stress fracture. The injury is primarily overuse so exercising the calf muscles, especially during the rest phase is not advised.